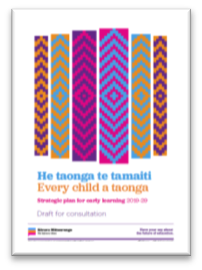 The ECC has prepared information for you so you understand what each of the five goals and 23 recommendations mean for your childcare centre. What assurance should we expect that the plan will be regularly updated, progress monitored and reported to the sector and parents? What assurance should we expect that the plan will have multi-party support so that it doesn’t get chucked out like the last one? Do you want a return of the 100% teacher funding band? Where do the additional teachers come from? If the ratios change, will you need more staff? And less children?? Should the Ministry be telling centre owners who can and cannot expand the number of centres they operate? What happens if someone is “blacklisted” by the Ministry? What right-of-review do they have? How does the Ministry’s increased monitoring of services sit alongside ERO’s role and where is the co-ordination? Will the co-construction of progress tools in effect remove the distinct characteristics of a diverse sector? Should all teachers (ECE and Primary) be paid the same? Who pays? How? Should the state be setting up its own childcare centres in competition with the rest of the sector? Should there be a review of the Playcentre and Kohanga funding model, or should the whole ECE funding model be reviewed with a view to simplification and more output/outcome-driven? These issues and many more introduced by the draft plan are being addressed in the ECC’s two-hour Briefing Sessions around the country and will help to populate the ECC’s submission on the draft plan. The ECC is very eager to see as many centres as possible submit their own views on the draft plan to ensure it remains balanced and fair. Submissions on the plan close on 15th March. Until then, centres are encouraged to attend one of the ECC’s briefing sessions (free to ECC members). To attend one of the ECC's briefing sessions (free to members; non-members: $30+GST) go to the ECC Calendar of Events page to find a session near you.